Turn your latch-hook project into a pillow. A small piece of latch-hook work will make a fun, fluffy pillow. Pillows are easier to incorporate into your decorating scheme than rugs or wall hangings. You don't need a sewing machine to complete this pillow. Trim the excess canvas from your project, leaving three empty rows. Measure the length and width of your hooked piece and add four inches to each dimension. Cut your backing fabric to these measurements. Iron up 3/4 inch on the edge of the backing fabric. 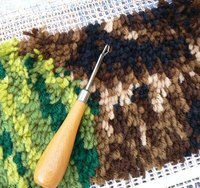 Fold under the empty canvas along the edges of the latch hook piece. Pin the backing to the pillow with the right sides together. Sew the pieces together by hand with heavy thread. Stitch through every square of canvas, easing in the extra fullness in the backing. Leave an eight-inch opening in one side for turning. Turn the pillow right side out, and stuff it firmly. Sew the opening closed. Make several pillows in similar colors and themes for a coordinated look for your bed.